The Fairey Flycatcher was a British single-seat biplane carrier-borne fighter aircraft made by Fairey Aviation which served in the period 1923 to 1934. It was produced in both landplane (carrier use) and floatplane (catapult use aboard capital ships) forms. The Flycatcher was designed to meet the requirements of Specification N6/22 for a carrier and floatplane fighter to replace the Gloster Nightjar, powered by either the Armstrong Siddeley Jaguar or the Bristol Jupiter radial engines. Both Fairey and Parnall submitted designs to meet this specification, with Fairey producing the Flycatcher, and Parnall, the Parnall Plover. The Flycatcher first flew on 28 November 1922 , powered by a Jaguar III engine. Small orders were placed for both the Flycatcher and Plover to allow service evaluation. After trials, the Flycatcher was ordered for full production. The Flycatcher was a remarkable design for its time and was one of the earliest aircraft specifically designed for operation from aircraft carriers. Flaps ran the entire trailing edges of both wings. These could be lowered for landing and takeoff, providing the aircraft with the capability of using only 50 yd (46 m) of deck space "to come and go." The fuselage was made of both wood and metal with fabric covering. A rather cumbersome undercarriage could be changed for twin floats or a wheel/float combo for amphibian use. Hydraulic wheel brakes were added to assist the aircraft in stopping in the confined space of an aircraft carrier. Arrestor hooks on the undercarriage spreader bar were a feature of early models, designed to engage the arrestor wires strung out on the carrier deck. Production of the Flycatcher began at Fairey's Hayes factory in 1923, entering service with No. 402 Flight Fleet Air Arm. The Flycatcher was flown from all the British carriers of its era. Some 192 were produced. 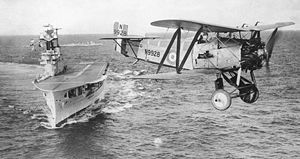 A typical deployment was on the aircraft carrier HMS Courageous, where 16 Flycatchers would serve alongside 16 Blackburn Ripons and 16 reconnaissance aircraft. Very popular with pilots, the Flycatchers were easy to fly and very manoeuvrable. It was in them that the Fleet Air Arm developed the combat tactics used in the Second World War. The Flycatcher saw service with the Home, Mediterranean, East Indies and China fleets. During its service on the China station, the Flycatcher was active against Chinese pirates in the waters near Hong Kong. Single-seat fighter aircraft for the Royal Navy. Prototype of planned replacement for Flycatcher I. Fundamentally a completely different aircraft from the Flycatcher I, the all-metal Flycatcher II first flew in October 1926, competing against the Gloster Gnatsnapper, Hawker Hoopoe, Armstrong Whitworth Starling and Vickers Type 123/141 to meet specification N.21/26. Specification later abandoned. No production. - Provision for 4 × 20 lb (9.1 kg) bombs under wings. - Mason, Francis K. The British Fighter since 1912. Annapolis, MD: Naval Institute Press, 1992. ISBN 1-55750-082-7. - Thetford, Owen. British Naval Aircraft since 1912, Fourth Edition. London: Putnam,1994. ISBN 0-85177-861-5.